Chicago Children's Theatre does it again! They are bringing the classic bedtime story Good Night Moon by Margaret Wise Brown, to life at the Victory Biograph Theater. I can hardly wait to take the boys and watch their little faces light up as Bunny's room comes alive. They had such a good time at the performance of Dot and Ziggy in the spring, I just know they'll enjoy this familiar bedtime story as well. We loved that the CCT was so very child friendly and the kids were encouraged to interact with the performers. It certainly made us feel better about bringing an 18 mth old to the theater. Additionally, CCT has partnered with Scholastic Books and The Pajama Program, a non-profit organization which provides new, warm pajamas and new books to children in need in Chicago and around the world. 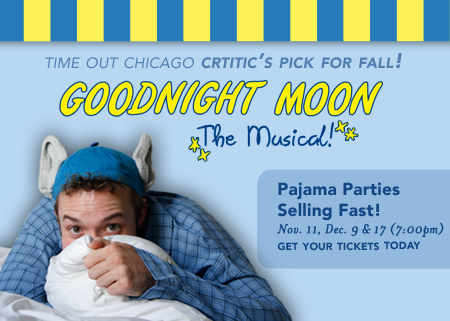 Throughout the run of Goodnight Moon The Musical, Chicago Children's Theatre will post a Pajama Drive donation bin in the Biograph lobby during every performance. For every pair of new pajamas donated during the run of Goodnight Moon, Scholastic Books will donate an equal number of early learning books for disadvantaged youth. The show runs from October 27 through December 23, 2011. For more information regarding show times and to purchase tickets visit Goodnight Moon-The Musical. Disclaimer: I was given complimentary tickets to a performance but all opinions are my own.